Torah study with Chanah from Darshan Yeshiva. This week’s portion is Beshalach (Exodus 13:17-17:16). The flee from Egypt will be discussed. Hosted by David “haShamash”. Brief observance followed by a topic of discussion. This week: WWW: Commandments and the internet. You don’t want to miss it! This weeks Haftorah portion study lead by our new volunteer Troy! We will discuss Judges Chapter 4. No experience required. Michael aka “Thing 1” will lead us in Havdalah and Maariv to welcome the new week. The universe is pretty boring. One look at the periodic table and you’ll know everything. These elements make up the whole show. You and I are a stew of those elements. So is a chair, an asteroid, the fossil of an extinct dinosaur and your breakfast cereal. The reason we have something instead of nothing is a complex tale, but the bottom line is that the laws of nature began to form right after the Big Bang: a moment of intense pressure release where all the stuff in the periodic table, the stuff that makes you, me and everything in between, came bursting forth. What we see today is the result of that chaotic ballet. Everything in the universe is the same, and yet, we have incredible diversity. Solids, liquids, gases, plasmas, life, inanimate objects, forces of nature, poets, artists, madmen and everything else comes from the same old boring junk that hangs on a chemistry teacher’s wall. What makes it all different is not what it’s made of, but what is done with it. Why are things the way they are? It’s not the stuff, but it’s the forces behind the stuff that gives it substance. An apple appears harder than water because of the way gravity plays with the molecules which make up the juicy fruit. And a person is more complex than a butterfly because millions of years of evolution have taken that butterfly and that human in two different directions. But all of this, in the end, is about relationships. What we think of as an atom is held together by a relationship of forces to protons, electrons and neutrons. What holds all that together are subatomic particles called quarks. And what we think holds all that together is a bunch of strings, or perhaps multiverses. We don’t know the answer to that yet, but a lot of people smarter than me are working on it. What we do know is that everything in the universe is held together by relationships of stuff to one another. If everything is held together through relationships, and we as people are made of the same “everything”, then what about our relationships? What holds us together? We know what the laws of nature are. So what are the laws of human nature? And is it really all that different? Could the same stuff that binds the universe together bind us together as well? And what do we call that? Let’s talk more about this Friday night, August 23rd at 5PM EDT at OneShul.org. For more info, check us out on Facebook. Rabbi Patrick is the director of PunkTorah and OneShul. When he’s not waxing poetic here at PunkTorah, he can be found playing in rock bands, officiating weddings and searching for the best cappuccino on the planet. We get asked all the time “how can I help PunkTorah?” We also know that transparency is an important part of any 501(c)(3) non-profit organization. So we have combined those two elements together to create the What PunkTorah Needs list. Here you can donate for exactly what YOU want. Are you a fan of our YouTube channel? Donate to JUST that. 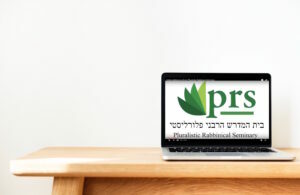 Do you want to see OneShul continue to offer online Jewish classes, holiday services and Shabbat services? Donate to that. It’s easy…just click the green button, pick an area of PunkTorah you want to fund (videos, payroll, chat rooms, etc.) and donate!